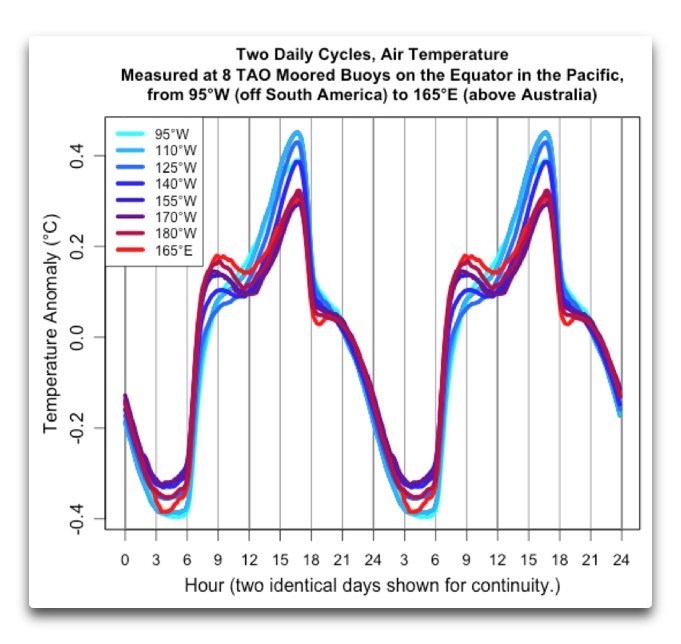 The Fourth National Climate Assessment and reality (Climate measurements versus Climate models) – Len Bilén's blog, a blog about faith, politics and the environment. and back to ice age. 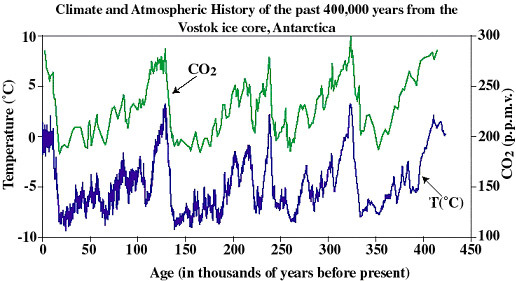 During ice ages CO2 concentration is sometimes below 200 ppm, barely enough to sustain plant life, and during an interglacial periods it is above 280 ppm. What makes this time unique is the rapid rise in CO2 concentration of about 3 ppm per year, with no end in sight. It is now at 405 ppm. As we can see from the chart above, temperature and CO2 concentration follow each other closely, so that must mean that we are headed for a temperature catastrophe in a few years. A 40% increase in CO2 concentration leads to an 8 C increase in temperature. The CO2 concentration has increased by more than 40% since the onset of the industrial revolution, so we should expect a rise in global temperature averages of at least 8 C. Global warming is here, and we are all doomed! This would be true if rising CO2 is the major component to Climate Change. Lucky for us we now have 40 years of satellite and balloon temperature data to serve as a good indicator of how earth reacts to rising CO2. The United Nations’ IPCC (Intergovenmental Panel on Climate Change) keeps ignoring measurements and relies on theoretical models rather than examine the earth as a black body and see what has happened so far to global temperature as CO2 has increased from 335 ppm to 405 ppm. In real estate appraisals the three most important factors to determine the value of a property are: Location, location, location. Likewise, in climate modeling the three most important factors to estimate the future climate on earth are: Clouds, clouds, clouds. 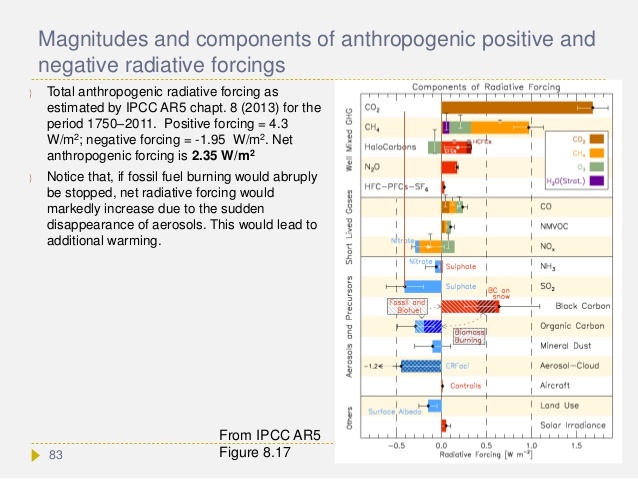 This table is listing all the possible contributions to radiative forcing that IPCC chose to list. It does include the effect of aerosols on clouds, but it assumes that this is the sum total of the effect of clouds. 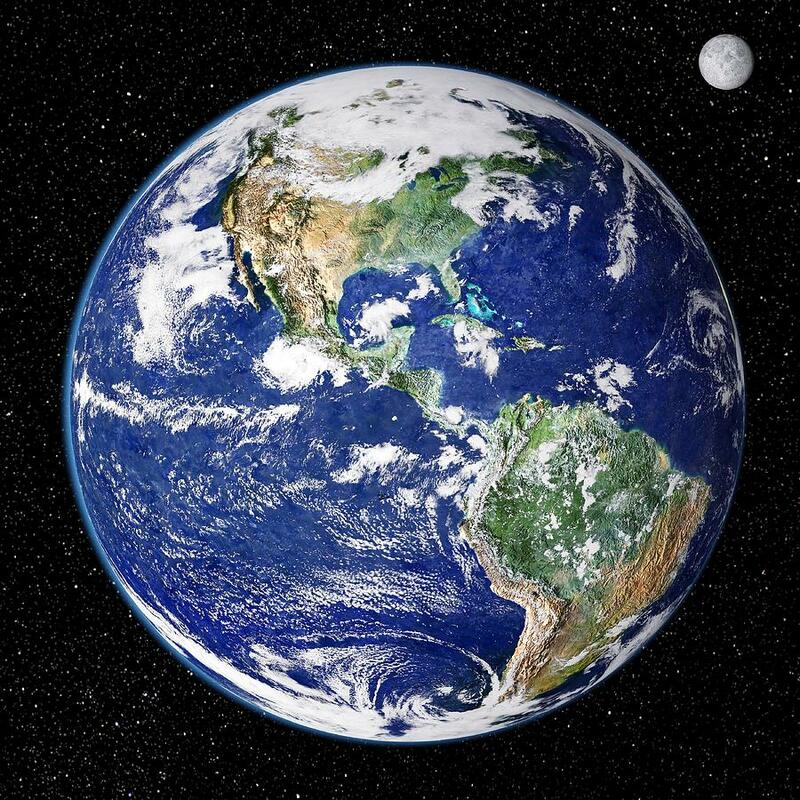 Let us take a look at a picture of earth from space: The first impression of earth from space is: How beautiful! Green land, brown mountains, blue oceans and absolutely white clouds! The clouds seem to reflect all incoming sunlight, and indeed, clouds can have an albedo of about 0.9, versus ocean with an albedo of about 0,07. Taking a look at the energy flows, we can see that the clouds reflect about 79 W/m-2 back into space, or about 23% of the incoming sunlight. But that is only half the story. 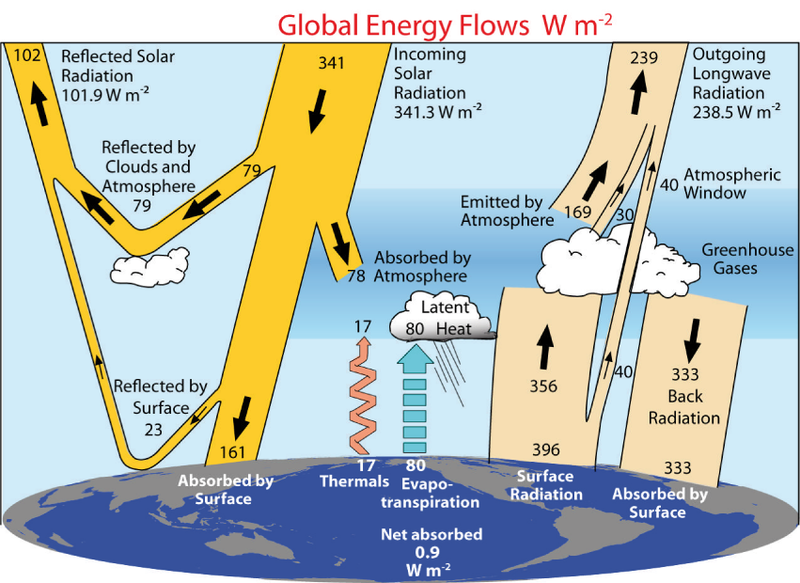 Clouds are even more important than that for the energy balance of the earth. If you have a house with no air conditioning, and it is hot in the summer, you close the windows and close the shades during the day to keep the hot air and the sunshine out. Then during the night you open the windows and shades to let the cooler air in. In the winter you do the opposite, during the day you may or may not open the windows dependent on the temperature, but you always let in as much sunshine as possible. Then at night you draw the shades to retain as much warmth as possible. By manipulating the windows and shades you provided the negative feedback to keep the house somewhat temperature controlled. In fact, you acted as a governor, providing the negative feedback necessary to keep the house temperature controlled. It is the same with clouds, they cool by day and warm by night, and they come and go, so it does matter a great deal when they do appear. At the risk of oversimplification let me take a stab at 3 cloud types, clouds, clouds, clouds. Cumulus clouds, also called “Beautiful weather clouds.” The best example comes from Willis Eschenbach from his observations on a tropical island. The morning starts clear, and as the sun heats the moist air cumulus clouds appear around 9 a.m., and the temperature goes down! Cumulus clouds have an albedo of about 0.9, so 90% of the incoming radiation of 341 W/m2, or up to 300 W/m2 does not reach ground at mid day but is reflected back into space. The sun continues its path, and by mid afternoon Cumulonimbus clouds may appear. They are also called thunderstorms. In addition to have a very high albedo, they transfer a lot of heat to the upper atmosphere, rain out, keeping the ecosystem going, and cool the lower atmosphere. The third very important type of clouds are frontal clouds. They carry energy in the form of water vapor from one area to another, in the northern temperate region typically from Southwest to Northeast, but they can also follow the jet stream, which exhibits a wave pattern. Not very encouraging. They all miss the mark. The only way to explain this discrepancy is that they all put too much emphasis on CO2 and way too little on clouds. The clouds are the main temperature regulator in the ecosystem, providing a strong negative feedback once the temperature is favorable for cloud formation. Unless the oceans run dry we will never have to worry about a thermal runaway. Volcanoes: Volcanic eruptions like Pinatubo can decrease global temperatures by a degree or so for a few years. A super volcano like Yosemite erupting will trigger the next ice age. Solar cycles: Solar cycle 24 is the most quiet in a century. A new solar minimum is to occur in the next few years and solar cycle 25 promises to be even quieter. When this happened last time it caused the little ice age, the winters were brutal indeed, and cloud covers increased, cooling the earth by at least half a degree. The earth’s magnetic field is starting to act erratically. 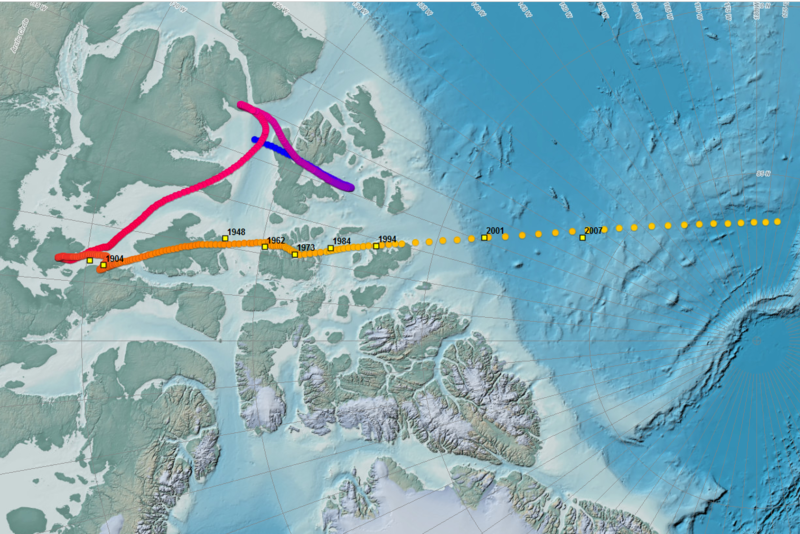 The magnetic north pole is speeding up and is now way up in the Arctic, near the North pole. The chart on the right shows the observed north dip poles during 1831 – 2007 as yellow squares. Modeled pole locations from 1590 to 2020 are circles progressing from blue to yellow. In addition the magnetic field is getting substantially weaker, maybe a breakup is possible having two North Poles and two South Poles. If this occurs, the protection from the cosmic radiation from the Sun will be weakened, causing more clouds and maybe trigger the next ice age. In any case, we are going to a cooler earth, and it is only a matter of time until we enter another ice age. The good news is, there is still time to develop and switch to Thorium based nuclear power generation when coal and oil are exhausted, and there is unlimited quantities of limestone to degas and make cement to keep the CO2 level up. The good news is that thanks to increasing CO2 vegetation is increasing, reducing erosion, feeding another 2 billion people without starving, and also the fauna. The benefits flow from industrialized nations to developing nations that cannot afford fertilizers but benefit from the increased CO2. In addition, photo synthesis occur more efficiently, using less water with increasing CO2. Here is then my response to the fourth national climate assessment. The impacts of climate change are already being felt in communities across the country. This is called the Urban Heat Island effect, and is in my opinion one of the major reasons urban dwellers believe in Climate Change, since they are experiencing it. Rural people on the other hand experience no such thing, they rather listen to their grand-father saying: It was much warmer and worse in the thirties. It remains a challenge though to build cities without an Urban Heat Effect; no more air conditioning, anyone? The best mitigation we can do is encouraging electrification in developing countries. Learning from the Amish one can do a lot by using wind mills and solar energy locally. Communities will need conventional power plants, the least expensive way is to build power plants, using coal or renewables, rather than cooking their food with dried cow-dung as fuel. Coal fired plants will be necessary in the near future, but the long term solution is to switch to a Thorium based energy economy. but annual rainfall is increasing somewhat. Seen as a totality, weather related risks as a percentage of GDP is decreasing. As seen in the introduction most of the real threats are that we are entering a colder phase in the ever changing climate. Increasing CO2 will help mitigate the problem. Long term, coal , gas and oil will run out, and the alternatives are renewables, such as hydro energy, biomass, solar and wind. They will not solve the problem, the highest need for solar is in heavily populated areas where real estate is spoken for. Rooftop solar will help, but at a high price. The best windmill places are already spoken for, far from the user. Hydroelectric is in areas far from consumers, and is mostly already utilized, except the Kongo river in Africa. To get a grip on the need for more energy we need to develop Thorium nuclear energy as fast as possible. This will give us enough electrical energy for the next million years, saving precious hydrocarbons for carbon based transportation, like airplanes. The safe, clean water essential to all life is rapidly running out in much of the world. Yet the politicians are concentrating on air pollution in the form of CO2 and methane as if a catastrophe is about to hit us. The world has not gotten any warmer in the last 20+ years, and the future trend is down, unless the sun does something quite unexpected. check US November average temperature. In the meantime much of the world’s safe water supply is disappearing. The western US, much of the 10-40 corridor, Australia and western South America are using up its safe water much faster than it is replenished. In addition, what is left is getting polluted.Let me give you an anecdotal example. A few years ago I was part of a team that made wet processing equipment for making computer chip wafers. It involved cleaning and etching using isopropyl alcohol, hydrochloric, sulphuric, and hydrofluoric acid as well as Ozone, all potent stuff. To collect the used chemicals we had designed a 5-way output port, so the chemicals could be collected separately. The equipment was made and shipped off to South Korea. It was assembled in a brand new, state of the art positive air pressure clean room facility. The processing equipment was installed, and under the 5-way port was a large funnel, going to the drain and directly out in the sewer. In China many of these facilities are inland, so large water aquifers get poisoned for centuries to come. In addition, Huang Ho (The Yellow River) does not empty out into the Ocean anymore part of the year, all the water is used. These are the people we entrust with our future production of just about everything, since we will have to cut down on our energy use thanks to a previous administration hostile to energy development, while China is exempt, building dirty coal-fired plants as fast as they can. They install scrubbers, but scrubbers cost money to run, so they are frequently out of service ( being “serviced”). This results in a large brown upper atmosphere smog extending from China to Pakistan acting as a giant heat sink. The temperature in the tropics will not change at all. Except the effect from the el Ninos and la Ninas the tropics has found its temperature. Where temperature will rise somewhat is at the poles, mostly from increased snowfall, and to a lesser degree from increasing CO2. Since many more people die from excessive cold than from excessive heat, this leads to improved health. We are having increased challenges with allergies, asthma and other diseases due to an increasingly polluted environment but CO2 is not a pollutant. The health challenges are enormous. People travel to places with drastically different bacteria and virus cultures,and absent from putting people in quarantine upon return, these challenges will increase. Many Indigenous peoples are reliant on natural resources for their economic, cultural, and physical well-being and are often uniquely affected by changing environmental conditions. The impacts of change on water, land, coastal areas, and other natural resources, as well as infrastructure and related services, are expected to increasingly disrupt Indigenous peoples’ livelihoods and economies, including agriculture and agroforestry, fishing, recreation, and tourism. Adverse impacts on subsistence activities have already been observed. As CO2 increases, adverse impacts on culturally significant species and resources are expected to result in continuing need for adaption as has always been the case. The biggest impact on indigenous people is still the radio, TV and the internet. Many benefits provided by ecosystems and the environment, such as clean air and water, protection from coastal flooding, wood and fiber, crop pollination, hunting and fishing, tourism, cultural identities, and more will continue to be challenged as the climate always changes. One of the biggest challenges is the introduction of invasive species, leading to disruption in the ecosystem. One must exercise continuing vigilance limiting their introduction. One example is the introduction of the Kudzu vine as use for cattle fodder and to prevent soil erosion. Agriculture is one of the major beneficiary of increasing CO2 levels. Photosynthesis works better with increasing CO2, and it consumes less water to do its work! 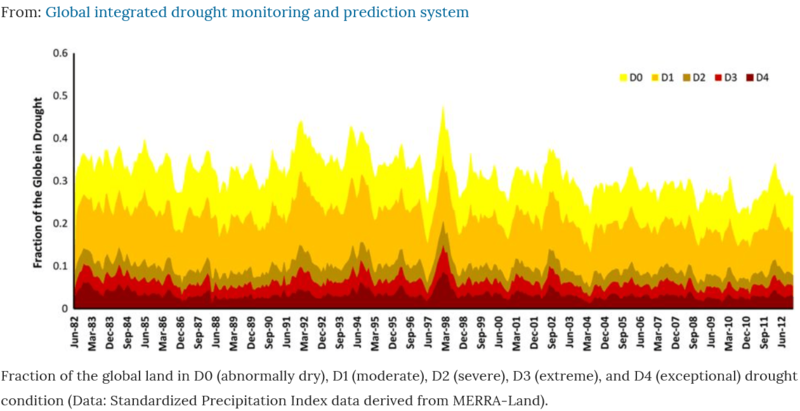 As we can see from the picture below, the greatest increase in efficiency occurs in arid Sub-Sahara and the western part of the United States, India and Australia, all water starved regions. Climate change and extreme weather events are expected to continue to disrupt our Nation’s energy and transportation systems, threatening power outages from a vulnerable national grid. Infrastructure designed for a time long past is deteriorating, vulnerable to weather extremes and increasingly to terrorist and cyber threats.. 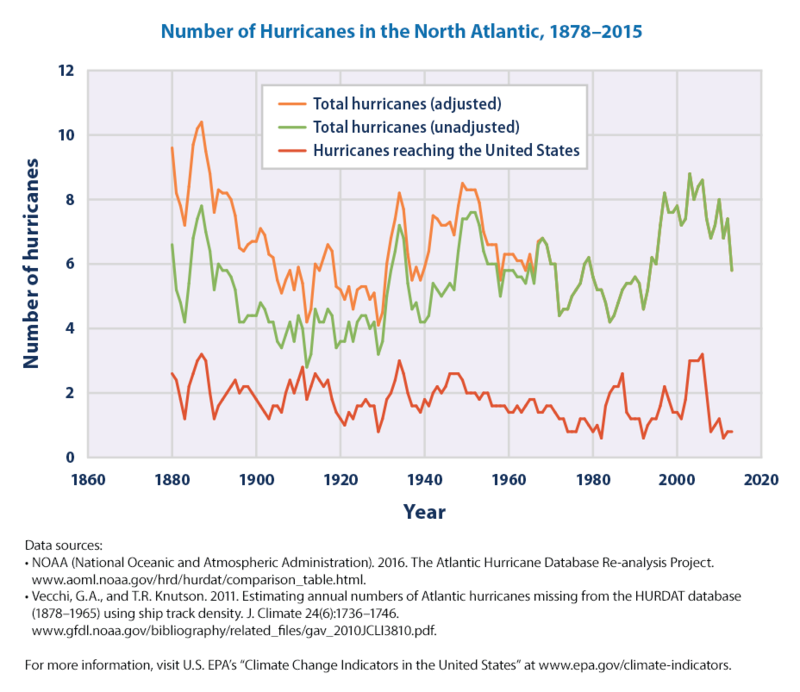 The continued increase in the frequency and extent of high-tide flooding due to the sinking of the Atlantic coast threatens America’s trillion-dollar coastal property market and public infrastructure. Amazon has just decided to move their corporate headquarters to two new locations, one of which is the tidewaters of Queens, a location that was completely flooded by superstorm Sandy, so Amazon Corporation, for one, is not worried. 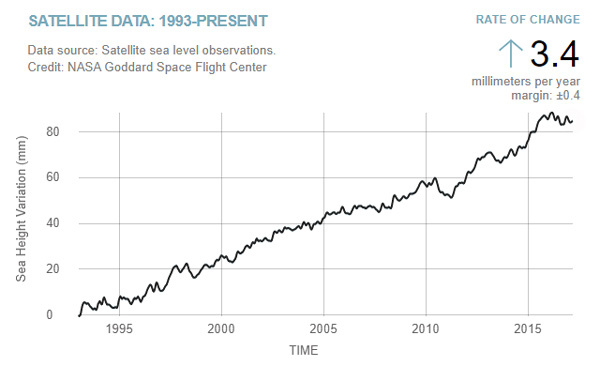 The average sea level rise over the whole world is 3.4 mm/year or about a foot per century, and is not increasing. We are still recovering from the last ice age. The planet is becoming less ovoid, more like a sphere. In the Bothnian Bay land is rising out of the ocean at a rate of about 3 feet per century and in Hudson Bay the rise is as much as 4 feet per century. It is by no means over yet. The Eastern Seaboard is slowly sinking into the sea, more than the rest of the world. 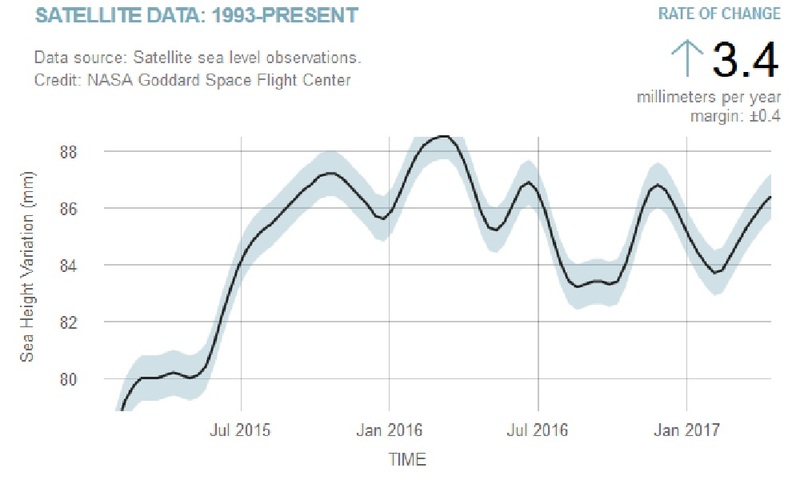 The expansion of the ocean water volume is not accelerating. 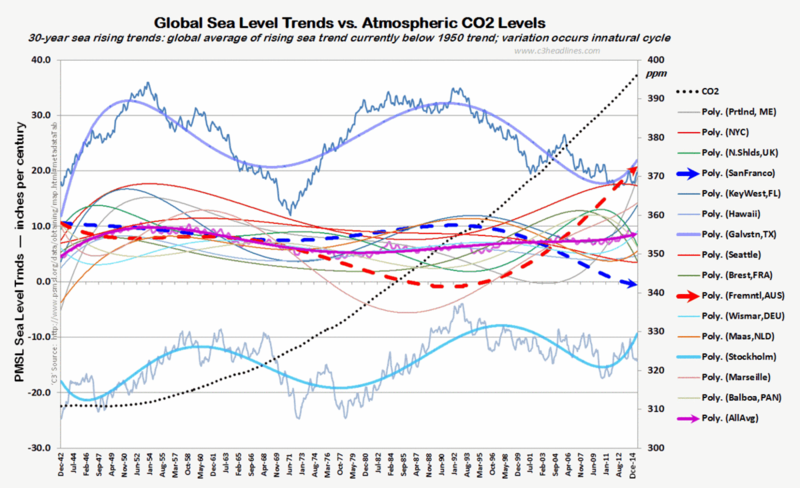 The take home from this picture is that there are cyclical factors quite apart from rising CO2, but sea level rise is not accelerating. As to ocean acidification, blame the Chinese. They use half of the worlds coal production and spews out more acidification emission than the rest of the world combined. This ends up in the upper pacific region, and some even reaches the Arctic snow, resulting in lower albedo and earlier snowmelt, even as overall snowfall is increasing. Check the brown cloud over China! The greening of the world that is occurring with increased CO2 does not only have great benefits to agriculture (point #9), but it beneficial to wild plants and animals as well. Trees will grow in areas before considered too dry, and their roots will help reduce erosion, and in time improve the soil. More vegetation, more birds and animals make for better wildlife areas. Yes there will be more flies, gnats and other insects as well, but that is part of nature. If you don’t like nature, even though they are shrinking, there will still be a few deserts left for you to tourist in. Previous Previous post: Penn State University Engineering Capstone Showcase, Fall 2018. Next Next post: Merry Christmas! A very traditional Scandinavian Christmas!